The ability for the gaseous agent to be retained in the protected room for an extended period of time is critical to the performance of any total flooding clean agent fire extinguishing system. NFPA 2001, Standard on Clean Agent Fire Extinguishing Systems, requires that a minimum concentration of 85% of the adjusted minimum design concentration be held at the highest level of combustibles for a minimum period of 10 minutes. Those installing these systems are required to perform a Room Integrity Fan Test to assure the protected room will hold the agent for the required period of time. 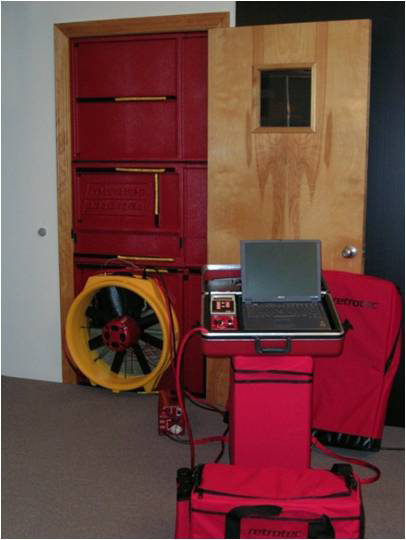 A Room Integrity Fan Test, also known as a Door Fan Test, is simply a way to measure the leakage of an enclosure. A large fan is temporarily installed in the doorway of the room to be tested, with the fan blowing into the room (pressurizing the room). The fan speed is adjusted to obtain flow pressure equivalent to the pressure exerted during a fire suppression system discharge. The fan is then reversed on the door to draw air from the room (depressurizing the room). The airflow and pressure readings obtained are entered into a computer program designed to calculate the equivalent leakage area (ELA) for the room. When a room has a suspended (drop) ceiling, then the below ceiling leakage area (BCLA) is calculated as one-half the total ELA and is used in the calculations for retention time. 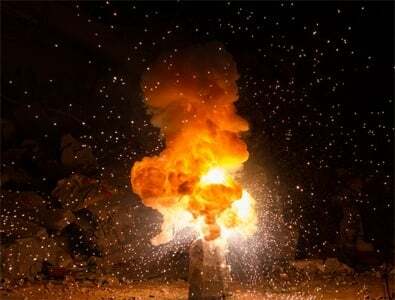 Given that most gaseous chemical agents used for fire suppression are heavier than air, the agent will begin to leak out of any lower level penetrations left unsealed. The rate at which the agent leaks is directly proportional to the amount of leakage at higher elevations of the room. As agent leaks out, fresh air replaces it from above. The point where fresh air above meets the concentration air mixture is called the descending interface. Because of its nature, a Door Fan Test will always calculate the worse case leakage for the room. It draws air through leaks in the room and under the floor as well as above the suspended ceiling to predict the descending interface of the suppression agent. The length of time it takes for the descending interface to reach the minimum protected height identifies the concentration hold time. Most rooms housing mission critical equipment are constructed with the perimeter walls extending from “slab to slab” in a manner that creates a fire rated barrier around the room. Because of their construction, these rooms will have fewer leaks and have a much greater chance of passing a standard Room Integrity Fan Test. However, it is possible to achieve a successful test in a room where the perimeter walls do not extend from “slab to slab” but instead extend only to above the suspended ceiling. Rooms like this with large overhead leaks will not pass a standard door fan test but can be successfully tested by other means. Experience has shown that enclosures of this type are capable of retaining clean agent for a prolonged period of time. When preparing a room to retain a gaseous fire suppression agent, the walls and slab must be inspected for penetrations and leakage points. All areas of concern must be properly sealed with fire retardant materials and doors fitted with pressure seals around the jams and threshold. In some circumstances it is necessary to gain the approval of the local Authority Having Jurisdiction to waive the quantitative results of a standard door fan test and instead conduct a detailed witnessed leak inspection. This alternate testing process is described in NFPA 2001 Annex C.1.2.2 (5) in a section titled Technical Judgment. Using the door fan and a smoke pencil, all floor and walls are closely examined for leaks. If the smoke moves radically around potential leakage points, one could assume air is passing through the leak, and therefore improperly sealed. However, if the smoke behaves in an acquiescent manner around potential leakage points, one could assume the room is sealed correctly and therefore passes the test by “technical judgment” of the Authority Having Jurisdiction.